Immediately, I was sucked in by the Lulu Guinness suitcase sets, especially since I purchased a great wristlet from the line they did at JCPenney. I really loved the adorable moulded lips design looks awesome in bright pink. The inside is just as adorable... awesome stripes! It also has a split design like my Burton, which makes packing so much easier in terms of staying organized. No digging! 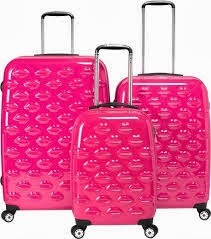 It's also important to look at lightweight suitcase sets, because the lighter your luggage the easier the trip. If a suitcase is heavy while empty, it drive me absolutely nuts. Why waste extra energy hauling that around? I also wish my Burtons were spinner cases like the other ones I am seeing more of these days. I also noticed that they had some great deals on Samsonite... a well-known brand with a great reputation. 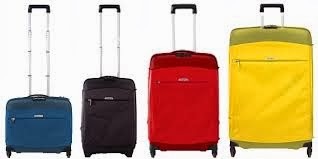 I haven't owned Samsonite before, but I know that "cheap Samsonite luggage" is usually an oxymoron; you can get a great deal on a set with Direct Luggage. I was compensated for this featured post, but the opinions shared are solely my own and at my discretion.